For centuries Aztec jewelry has fascinated everyone who has had the chance to see it. From the necks, ears and wrists of the nobles, the jewelry has made its way into museums and today replicas are sold all over the world. But what was it really like? Aztec art was generally owned by the upper classes, and jewelry was no exception (read more about general Aztec art). It was very common for emperors, for example, to wear necklaces and earrings. Craftsmen were no part-time amateurs. They dedicated their lives to their craft. In a world permeated with religion and symbolism, they had no shortage of work to do. Jeweller would sell some pieces in the marketplace, where a huge variety of colourful items were sold. When there was a major religious or state occasion, the nobility would glitter with a wide range of jewelry, though it looked a lot different than most cultures today. Aztec jewelry was made with a rich variety of materials, and often more than one type of material went into one piece. Mosaics were sometimes created by placing bits of precious stone into a background of clay or wood. Commonly used materials were copper, gold and silver, shells, clay, wood, rock such as obsidian, and feathers. Various precious stones were used, such as jade, quartz (such as amethyst), opal, moonstone, and turquoise. These were highly polished when used in Aztec jewelry and ornaments. Very little of the beautiful goldwork of this era survives today - whatever could be found at the time of the Spanish conquest was melted down. Still, a few examples do survive. (In 1975, some Aztec gold was found by an octopus fisherman. Known as the Fisherman's Treasure, it's on display in Veracruz) See some beautiful colour pictures of Aztec jewelry here. Copper was cold-hammered; the art of adding alloys to make bronze had not reached Mexico from the south, but the gilding of copper and mixing of gold and copper were adopted by Mexican goldsmiths. Copper was cast into bells and ornaments, and the process, used also for gold, was the cite-perdue, or lost-wax, method. The desired shape was modelled in clay, over which was dusted finely ground charcoal, followed by an even layer of wax. This coating was also dusted with charcoal and the whole enclosed in clay, which was perforated at the top and bottom. The molten metal was poured in at the upper hole after the wax was melted and the lower orifice plugged. When the metal cooled the cast was broken and the finished object removed. Though gold was used, silver was popular as well because it was (and is!) abundant in Mexico. Many of the other materials were imported - gold from the south, turquoise from the north, conch shells from the east. Stones were cut and polished using course and fine abrasive grit, much like we would use sandpaper. Simple drills were also used to bore holes in stone pendants or shells. Metal was often carefully hammered into sheets or other forms. 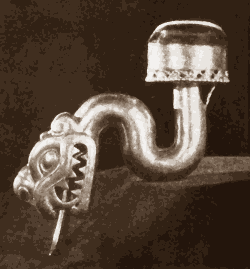 One common form of Aztec jewelry was the ear plug (also called ear spools). Examples of these large plugs can be seen in Aztec masks. Men and women both wore these. Men would often wear ornaments in their noses (through a hole in the nasal septum). Men would also wear jewelry suspended from a slit in their lower lip. An example of gold Aztec jewelry - a lip ornament. In this finely crafted piece, the snake's tongue even moves. Of course there were necklaces with charms and pendents, armlets, bracelets, leg bracelets, and rings as well. Often very ornate, Aztec jewelry would feature natural shapes, but would also be crafted into the shapes of birds, and reptiles, often with a religious significance. Small tinkling bells were popular, often fashioned to look like flowers. The little bells would then be hung from necklaces. See this artist's conception of what Moctezuma II looked like in his jewlery. And be sure to read more about Aztec art of many kinds right here!